Spain is mad for gin and tonics. It's ironic, Spain has some of the world's best wines and spirits, and yet this is easily the trendiest gourmet drink. Many cocktail bars have a separate gin and tonic menu. Last week I had the opportunity to visit a bartending school run by the Dry Martini chain of cocktail bars. 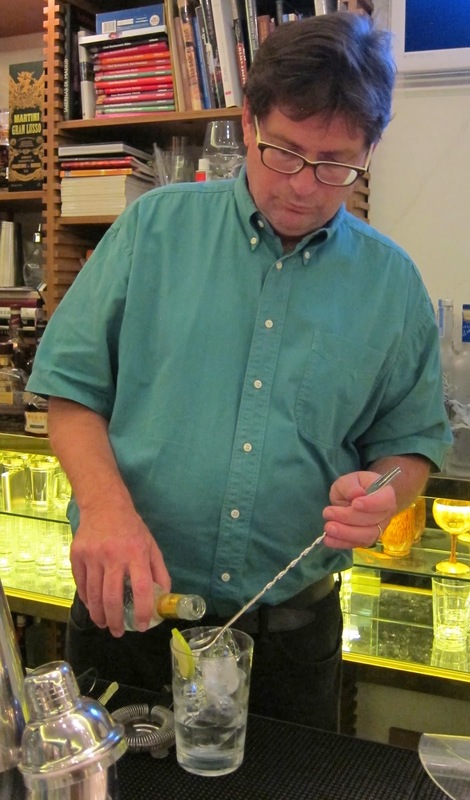 I was there for a demonstration of Cava cocktails, but the bartender/teacher asked if there was anything I wanted to learn to make. 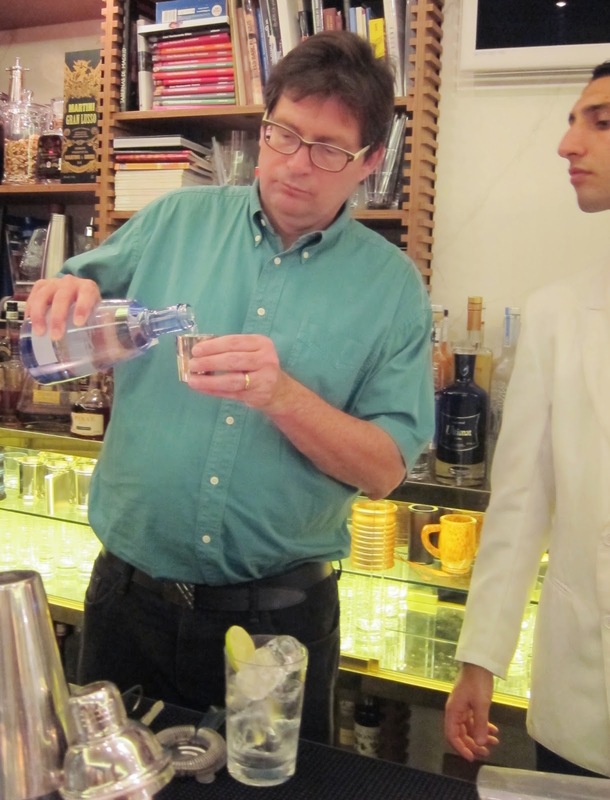 Of course there was: I wanted the secrets to a top-quality Spanish-style gin and tonic. The school director says the two main keys are the glass and the ice. For both, size matters. But there are a number of other steps I've never seen a US bartender take. It's not hard to make a better gin and tonic: here's how. 1) Use a big clear glass, big enough to hold 5 large cubes of ice (you will actually use 6). 2) Use the largest, clearest cubes of ice you can acquire. 3) Stir the ice around in the the glass to chill the glass. This is better than putting the glass in a freezer because the glass stays clear and gets no off flavors. 4) Drain the water from the glass; leave the ice. 5) Rub a thin slice of lime, not lemon, around the rim. Do not squeeze it, but put it in the glass. 6) Gin selection is crucial, obviously. The school divides gins into three styles: dry, aromatic, and fruity. I said I wanted aromatic so we went with Gin Mare, a rosemary-scented Spanish gin. It was OK, but I think if I had spent hours behind the bar instead of minutes, I might have chosen better. I know this step is crucial, but it's a whole post in itself for another day. Sorry. And did I mention that Spanish bars have whole menus for variations of this cocktail? 7) Tonic is also important. The Dry Martini school uses individual 200 ml bottles of Schweppes, which they believe have more consistent fizz than Fever Tree. However, I believe Schweppes has a lot less sugar in Europe, so I'm not sure I'll follow this advice at home. Whichever you choose, buy small bottles and store your tonic in the refrigerator; do not use room-temperature tonic. 8) My tutor suggested 60 ml of gin and 160 ml of tonic. When I experiment more at home, I will use a bit less tonic; this was a lot of alcohol but I wanted more gin flavor. However, it must be noted that a drink with lots of cool liquid on a hot Spanish night is welcome. Whatever ratio you choose, use a measuring cup. Otherwise you'll never replicate. 9) After you add the gin, the ice will have melted enough to allow that 6th cube to be added. 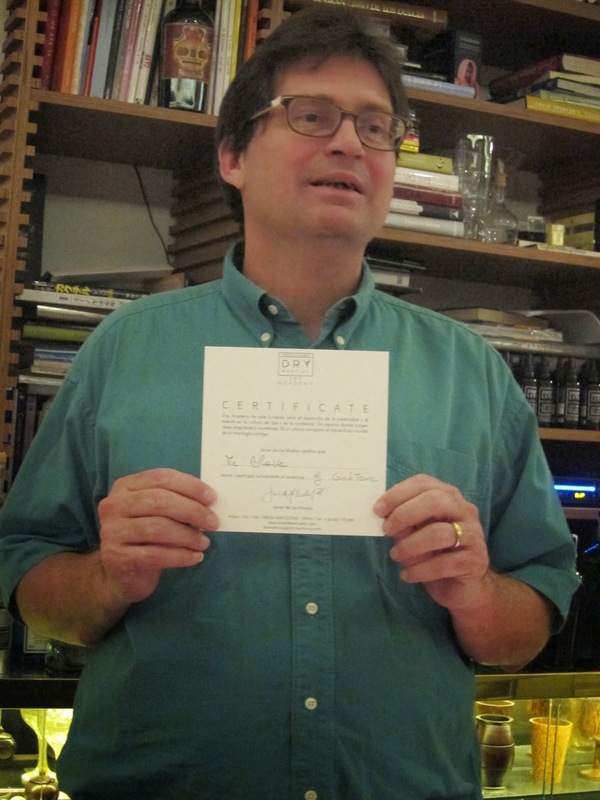 I got a cocktail diploma -- AND a drink! 9) Hold a spoon over the glass and pour the tonic into it, rather than directly into the glass. This preserves the fizz. That's it! It's cocktail hour now; class dismissed. Here in Paso we have a craft distiller that makes a "botanical brandy" (basically gin), that's quite good. I've been looking for a method to make perfect gin and tonics, thanks! I suggest making your own tonic water. A great recipe to start with is Jeffrey Morgenthaler's http://www.jeffreymorgenthaler.com/2008/how-to-make-your-own-tonic-water/ Besides saving your wallet a ton of dough by not buying Q or Fever Tree and your health by avoiding the high fructose corn crap in Schweppes and Canada Dry, you can tweak the recipe to pair best with your favorite gin. I was intrigued by the advice to use the biggest ice cube you can acquire. I bought several of Tovolo's 2 inch silicon ice cube trays to ice my old-fashioneds. Unfortunately they won't fit in either my collins or highball glasses. But I'm going to make a tray but not fill it with water to see how big a cube I can produce for gin and tonics. Thanks so much for this great post! Randy: I don't know if you can really see this in the photo, but that's a fairly tall, wide glass. The only glass I have at home that's anything like it is an iced-tea glass. I suspect that's what the bartenders would use if they raided my closet.